DVD players are awesome. Cars are awesome. DVD players in cars? Incredibly awesome. Well, that’s our opinion at least, and it’s not changing. A lot of vehicles, especially minivans and high-end SUVs offer built in DVD players, that either swing down from the room, are built into the front seat headrests, or are attached to the back of the front seats. However, most cars don’t have the luxury of having a headrest DVD player. And we think that should change. What’s the point of having a DVD player in your car? If you only ever drive alone, getting a DVD player isn’t going to do you much good. Don’t ever put a DVD player where you can see it as the driver, as that’s a huge safety hazard; you’re just asking to take your eyes off the road. If you have passengers in your car a lot, then a DVD player can make a world of difference. It can offer entertainment and luxury for your friends in the backseat. Or, it can help keep your children occupied when you’re on long drives and they might normally get restless or bored. If you’ve ever watch an in-flight movie, you know how quickly time flies when you’re entertained, rather than when you’re simply sitting there. If anyone you travel with finds being in the car boring, DVD players can completely transform the traveling experience. Furthermore, if you like car camping, a DVD player can make that a much more entertaining experience! What’s the benefit of getting a headrest DVD player? 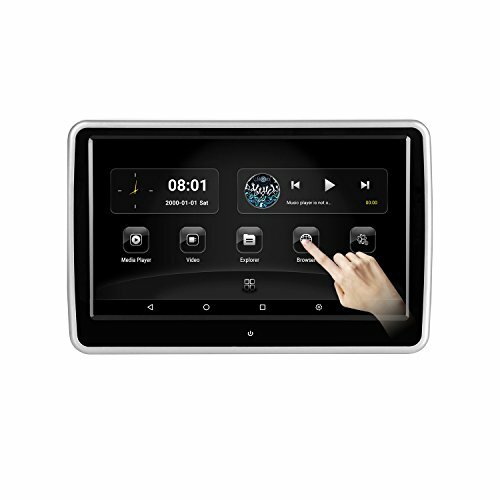 There are two primary types of DVD players that you can purchase for your vehicle. There are headrest DVD players, and there are freestanding DVD players. Both have their strengths and their weaknesses. The benefit of headrest DVD players is that they take up much less room, and are placed at the perfect viewing point for people in the back seat. You don’t have to hold them up or balance them anywhere; they just hang there, in the perfect spot for your viewing pleasure. The benefit of freestanding DVD players is that you can take them more places. A front seat passenger can put one on their lap, and you can take it out of the car if you need to use it elsewhere. They’re also usually a little bit more affordable. If you’re interested in buying a freestanding DVD player for your car, you should check out our buyer’s guide here. 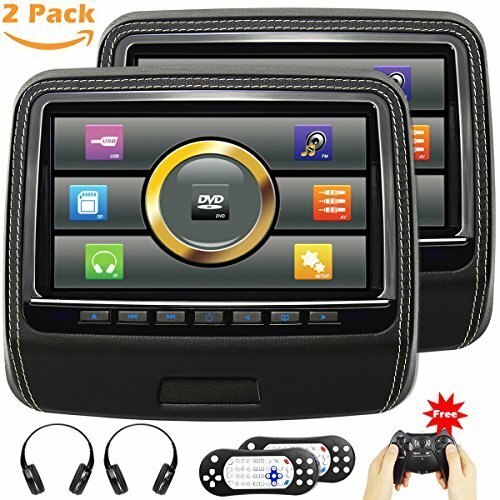 In the years since car DVD players first became a thing, lots of new features have emerged, that have made DVD players a lot more useful and diverse. It’s important to understand what these features are, so that you can be an informed buyer, and make a great decision. First and foremost, resolution has greatly improved over the years. Understanding resolution is simple: the bigger the number, the better the picture quality. Next, the inputs are important. While it used to be that DVD players could only play . . . well . . . DVDs, now many of them can play movies and video off of other devices. HDMI ports allow you to connect the screen to many computers, or gaming systems. USB ports allow you to connect the player to your smart phone or tablet. These types of inputs, which some DVD players have, and some do not, can really diversify the different ways that you can be entertained while in the car. Finally, there’s the case of audio. Some DVD players have built-in speakers, and those are the only way to listen to audio. Others allow you to connect to the vehicle’s stereo system, either through an FM radio transmission, or an AUX cable. There’s no one feature that’s necessary for a DVD player; each product has different features. But it’s important to identify what is crucial to you when you purchase one. With all that said, let’s take a look at our five favorite headrest DVD players. Each of these players is different than the others, but they’re all wonderful. We love each for different reasons: quality, price, size, features, etc. Between these five, you ought to be able to find a perfect headrest DVD player for you and your vehicle. From a pure performance standpoint, it’s really difficult to beat this product from KWONGLUNG. When we first read the description and the reviews, we were blown away. Then we tried it and somehow it exceeded our sky high expectations. Frankly put, this is nearly everything you could ask for in a headrest DVD player. First things first: the screen is big and beautiful. At 10.1 inches, it’s about as big as you’ll find for headrest DVD players. And the resolution of 1366*768 is about as high quality as is available. All the bells and whistles imaginable come with this headrest DVD player: an HDMI port, as well as a USB port, and an SD card reader. If you purchase two of the players, both screens can play the same content simultaneously, or they can act independently. It also has built in wireless games, and includes a disc with additional games. And that’s not just a marketing gimmick: we really enjoyed playing the games! And the remote control doubles as the game controller, which is a nifty feature. This DVD player mounts to the back of the headrest with hardware, and it’s incredibly secure. Despite that, it’s also easy to install, and very intuitive and quick. As if KWONGLUNG had to do more to make their product desirable, they include a pair of headphones with the DVD player as well. And they’re quite nice! There’s really only one drawback to this product: the price. But as we’re so fond of saying, you get what you pay for. If you want a borderline perfect headrest DVD player to add to your vehicle, you’ll have trouble finding anything wrong with this one. This model from XTRONS is nearly flawless. We were excited to try it out, and blown away when we did. Let’s get straight to the best part: this model comes already built into the headrest. You simply remove your old headrests, install these new ones, and there you have it. We recommend having a professional install them, to make sure that the electrical work is well done and covered. Having the DVD player built into the headrest accomplishes a few things: first, it keeps the player fully stabilized at all times. Second, it limits the amount of space that the DVD player takes up. And third, and perhaps most importantly, it looks incredibly slick and luxurious. Plus, you can choose between a variety of colors, to make sure that the headrest matches your vehicle’s interior. Despite being attached to the headrest, the screens on these DVD players can be tilted to find the perfect angle for viewers. Add that to a 9 inch screen, throw in an HDMI, SD, and USB port, and you have a headrest DVD player that is phenomenal. The amazing work is in the details, however. XTRONS includes a headrest cover that disguises the DVD player brilliantly, to keep the item from being advertised to potential thieves. A disc with numerous old school, but awesome games is included, as are remotes and game controllers. Plus, the picture quality is very nice, and the audio is pretty decent as well. The touch screen works fairly well, though not flawlessly. Still, we gave that aspect good marks overall. Simply put, this is a terrific product, and one that we greatly enjoyed using. Normally we like to be in the driver’s seat, but these headrest DVD players had us fighting for who got to sit in the backseats. This AUTOWINGS DVD player doesn’t have the bells and whistles that many other players have. And yet, despite that, we found ourselves completely in love with this product. If you want the latest and greatest technology, this may not be the player for you. If you want a player that just works well, and makes car drives a lot better, then this model is ideal. There’s a reason that, despite being the most expensive headrest DVD player on our list, the AUTOWINGS product has the highest Amazon rating. While this player has a relatively low resolution (800*480), it still supports 1080P video. It doesn’t have an HDMI port, but it does have a touch screen that works better than on any DVD player that we’ve tried. This thing is practically an iPad the touch screen works so well! 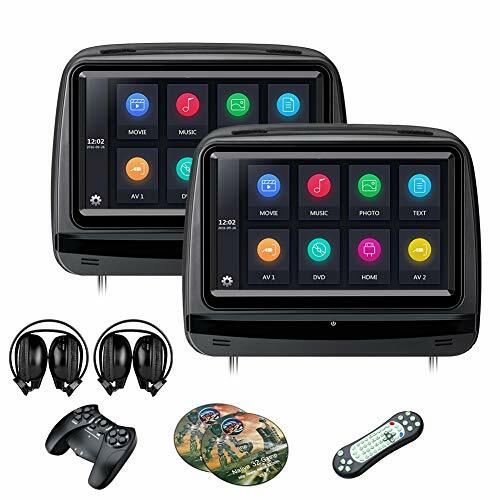 Two headrest DVD players are included, and it’s incredibly easy to switch them to different channels, so that each can play two different things. It’s also easy to play them together, and to channel the audio through the vehicle’s speakers. Ultimately, this is a model perfectly designed for the consumer. It’s easy to install, and attaches to the back of the headrest, where the headrest meets the seat. It’s easy to use, and we tried letting children, and people who weren’t incredibly comfortable with technology try it, and they had no problem; it’s that intuitive. The picture quality is very nice, gaming joysticks, wireless headphones, remote controls, and covers are included, and a CD with over 300 games also comes with the player. And the games are a blast! Sometimes products just work. This is one of those products. The Pyle Headrest DVD Player is the second product on our list that comes directly built into the headrest. While it doesn’t quite match the quality of the XTRONS product, it’s a great price. And since you can buy it by the single headrest, you can save a lot of money if you only want one headrest DVD player in your vehicle. The only real downside to this product is the size: the screen is 7 inches, easily the smallest on your list. That said, the quality is absolutely stunning, with a resolution of 1440*234. No HDMI port is included, but SD and USB ports are. Installation is a breeze, as it can be plugged into the cigarette lighter, though you can have a professional hardwire it if you want to remove wires and cords. A very nice remote control is included, though, unlike most of the players on this list, it doesn’t come with any headphones. Still, if you just want to watch DVDs, this player is fantastic. The audio isn’t that good, so it’s definitely best used with headphones, but you can manage either way. If you want a budget DVD player that offers exceptional video quality, you really can’t go wrong with this product from Pyle. It greatly exceeded our price-based expectations. This is the only product on our list that isn’t really a headrest DVD player. But we included it because it still functions as one, and, as is always the case, we like to give you a lot of options, so you can find the right product for you, your needs, and your car. 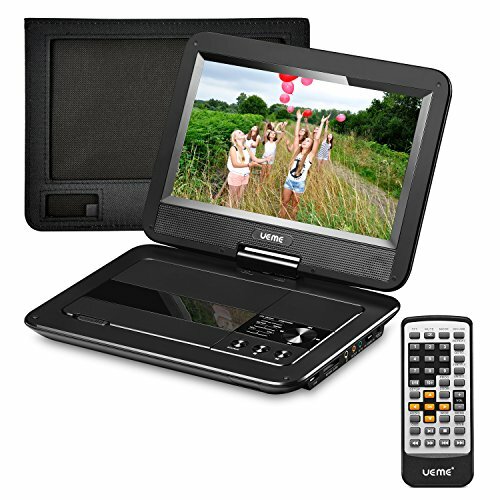 This UEME model is a freestanding portable DVD player, so you can use it on your lap in the front passenger’s seat, or take it out of the car if you hop on a plane, or a train. But here’s the great catch: it comes with a mount so that you can attach it to a headrest. Unlike some portable DVD players with mounts that we’ve tried, this mount is actually wonderful. It holds the DVD player firmly in place, and the screen doesn’t jostle around every time you turn the steering wheel or tap the brakes. The screen is large (10.1 inches), the resolution is stellar (1024*600), and the quality and use of controls is incredibly easy. And unlike some portable DVD players, it also has a USB and SD input port. Other than the headrest mount, the thing that impressed us the most was the sound. The quality is crisp, and the volume can get very loud; loud enough for the entire car to listen along easily. If what you want as a versatile DVD player that can be used as a headrest player, but also can be taken out of the car, then you’ve found the perfect unit. As you can see by our list, headrest DVD players cover a wide spectrum. In the five models we listed, you’ll find a variety of sizes, resolutions, prices, and features. There’s no one best headrest DVD player: it all depends on what you’re looking for. We always advocate making a thoughtful and informed decision when purchasing a product for your car. Before buying a headrest DVD player, think about what you’ll use it for, and what features are important to you. If you road trip constantly, or have young children who hate being in the car, it may be worth spending a few extra bucks to get all the bells and whistles. If you only plan on using your headrest DVD player once or twice a year, you may want to look at a cheaper model, or consider a portable DVD player. Only you know what is important to you in a headrest DVD player. Give it a long thought before making a purchase. 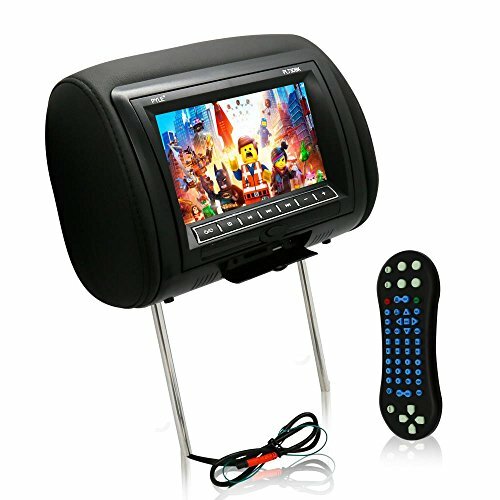 Headrest DVD players can completely transform your vehicle. Whether you go on long road trips with your family, or simply want to offer your guests a more luxurious experience when they’re in the backseats, headrest DVD players add entertainment, fun, and luxury to any and every vehicle. There’s a little something for everyone on this list, so hopefully you find the right product to take your car to the next level.